Far Rockaway will soon receive a state-of-the-art new library to replace the current one, which was affected last year by Hurricane Sandy. 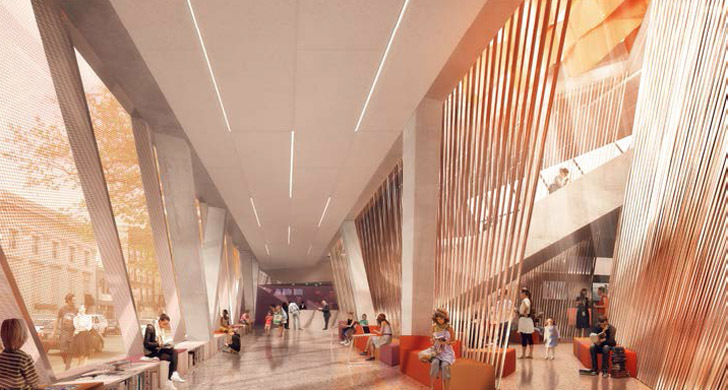 Designed by leading architecture firm Snøhetta, the new library will be double the size of the former, offering a larger space for the community to enjoy. The LEED Silver-seeking structure will also be an artistic architectural asset for the neighborhood with its facade of fritted, colored glass that echoes the Long Island coastal sky. The current library at the corner of Mott and Central Avenues is beloved by the community, heavily used by its members, and even acted as a disaster relief shelter after Hurricane Sandy hit the area. Its importance to the community called for an expansion and renovation in order to maintain its role as a vital community center. The new library will help to enliven the area as it continues to rebuild after last year’s hurricane. In honor of the beautiful landscape of the region, Snøhetta designed a gradated, fritted glass façade that mimics the colors of the Long Island sky, tying the area, which is heavily populated with retail outlets, to the beachfront Far Rockaway is known for. Alternating transparency and translucency will naturally light the library’s interior, while still giving occupants privacy. A glass pyramid entrance will welcome visitors, while the interior will center around an inverted pyramidal atrium. Natural light will be infused throughout the entire interior, giving an airy feeling wherever guests choose to hunker down with their books. The new library will exceed the new FEMA flood zone guidelines and seek LEED Silver Certification.